Finding a strange spot on your body can be a little nerve-wracking. If you’re like most, you will notice it without much worry and hope that it will fade away on its own. While there are some spots that do disappear without any indication of where it came from, some spots do stick around an pose more serious health issues. As Boulder’s Top Rated® Local Dermatology clinic, we encourage you to contact us and schedule an appointment to ensure that the spot isn’t anything you will need to worry about. However, in the rare event that the new spot is cancerous, it’s always best to find out sooner so you can treat it as quickly as possible. Even though a certified dermatologist or medical doctor are the only ones that can officially diagnose something to be cancerous, it is perfectly acceptable to educate yourself. In our blog today, we’ll discuss two common types of skin types and how to distinguish between them. Let’s go ahead and take a closer look at age spots (liver spots) and common spots that could be skin cancer. 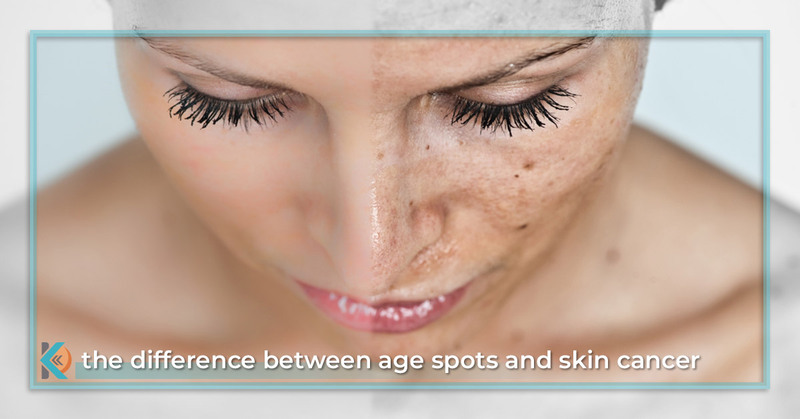 Age spots and skin discoloration is treatable, contact Kallgren Dermatology to learn more! Now that you know what a common age spot looks like, you are probably wondering what the difference is from a cancerous skin spot. Unfortunately, the similarities are awfully close and that’s why it is important to get evaluated at a dermatology clinic. Skin discoloration is a common sign of skin cancer, and only a dermatologist would be able to tell the difference. There are many different types of skin cancer that could be a minor disfigurement or a potential life-threatening cancer. Just like age spots, skin cancer is typically caused by excessive UV ray exposure that creates abnormal skin cells to grow rapidly. According to The Skin Cancer Foundation, melanoma accounts for less than 2% of skin cancer cases, it is the leading cause of deaths related to skin cancer. Another method to identify melanoma or skin cancer is using ABCDE. Asymmetry: Draw an invisible line through the growth and if the two sides don’t match, that means it is asymmetrical—a warning sign of melanoma. Border: Early melanoma shows edges that are typically uneven and notched. Color: Melanoma usually isn’t one solid color. Different shades of brown, black, and tan will develop. There have even been cases of red, white or blue discolorations. Diameter: Non-cancerous, or benign, skin growths are usually smaller than melanoma. If you notice a smaller growth begin to grow in diameter, this could be another warning sign. Evolution: Moles don’t change over time, melanoma does. As mentioned, if you notice any changes in color, size or symptoms of bleeding, itching, and crusting. Hopefully this article has helped you understand the differences of age spots and skin cancer spots. At the Kallgren Dermatology clinic, our dermatologists can identify, diagnose, and treat common skin cancers. If you have noticed a recent skin spot or discoloration that you are raising your concerns about, don’t wait! Contact the Boulder dermatologists at Kallgren Dermatology and schedule an appointment today. We look forward to seeing you soon!